Life insurance is often viewed as a confusing topic. In fact, according the 2015 Insurance Barometer study conducted by worldwide research organization LIMRA and non-profit Life Happens, 38 percent of consumers did not purchase (or did not purchase more) life insurance because they found life insurance research to be confusing. They did not know what types of policies they should buy or how much coverage they needed. 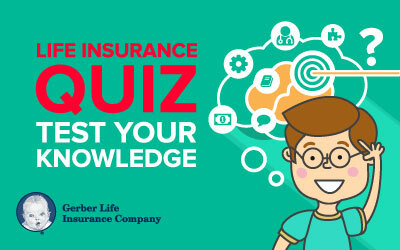 Put your life insurance knowledge and your knowledge of the Gerber Life products to the test and take our life insurance quiz below. If you get stuck, here’s a hint – all the answers can be found somewhere on our website. You are only able to buy Term Life insurance once during your lifetime. Term Life Insurance covers you for a designated length of time; Whole Life Insurance covers you for life. Whole Life Insurance does not require a medical exam, but Term Life Insurance does. You are only able to name your spouse as the beneficiary in a Term Life Insurance policy. What are some things you should consider when you deciding how much life insurance coverage you need? Always required; regardless of the policy and type of life insurance. Never required for any life insurance application. Sometimes required; it depends on the policy and type of life insurance. Approval is guaranteed regardless of health for which of the following policies? Which of the following statements about life insurance is false? Your lifestyle can impact your life insurance premiums . Life insurance is only necessary for those who are married or who have children. Life insurance benefits can be used to help pay for your children’s education. If your policy offers a cash value benefit, what can you use the cash value toward? You may convert the cash value of your policy into actual cash. You can use the cash value to buy continuing insurance coverage. You may use cash value policies as collateral. When determining how much life insurance you and your family need, which factors should you consider? Any immediate financial needs at time of death, such as medical expenses, burial costs and estate tax. How much money your dependents would need to be financially secure if the unthinkable should happen to you. What assets and income you currently have, including spousal income, savings accounts and assets that you would consider selling on short notice.